Basic Truths: I’ve shipped over 5,000 of these pots (under the Dunlop brand). Dunlop stopped offering them. I’m now supplied by the same electronics manufacturer Dunlop used. They are essentially the same pot, but configured in the classic, 3-lug, side-mounted style, as shown in the photo. They are military grade (“Type J”) and are guaranteed for a million cycles. Don’t expect to replace one of these for several years! You are most likely replacing a 500K (ohms rated) pot. The small difference in the ohms of this replacement pot, and the one in your volume pedal, won’t make a difference since all pots vary in resistance up to 15%. Trust me on this! The volume-output taper is gradual, certain (logarithmic scale), quiet and with minimal resistance. The pot's shaft length is one inch. I have not encountered a volume pedal that this pot will not fit! My pots come with complete installation instructions, and are actually quite simple to solder in. If you would like to read those instructions, ask me to email you a copy. 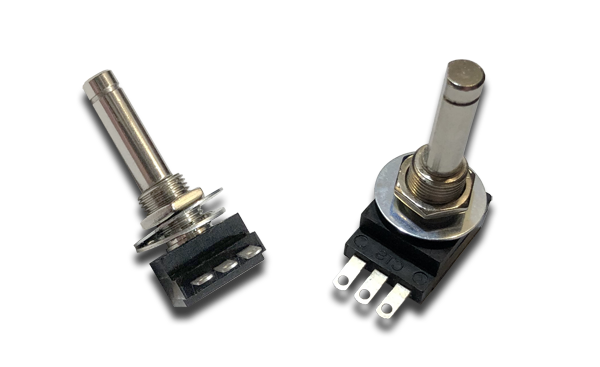 The instructions also allow you to access a video to assist in re-installing the rotation string, a requirement in about every volume pedal manufactured. If your current pot requires a gear, let me know and I'll include a new one for you.